The work of one of the world’s greatest and most popular writers Charles Dickens is being celebrated with an event in a city he claimed his favourite after London, and performed in a hall he described as the most perfect hall in the world. 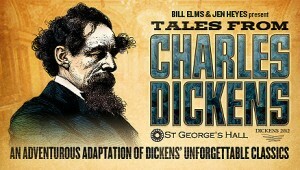 'Tales From Charles Dickens' features excerpts from Dickens's most popular family tales. Adapted and directed by Jen Heyes (Curiouser & Curiouser, The Spirit of Christmas, Blood Wedding, I love Vinegar Vera and Wall Talks), the world famous tales will be performed and read by four locally known actors from the ‘Tales From’ stable. Matinees: 2pm | Evenings: 7pm Tickets: £14 (Stalls & curved seating) £12 (Balcony) Matinees – Children go half price. Box Office: 0844 8000 400, online at www.echoarena.com (or in person at the Echo Arena, Kings Dock, Liverpool).